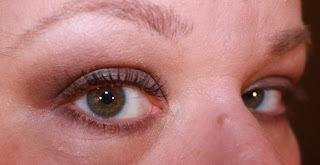 Welcome to the hump de bump of the week of Mascaras and the review of Hard Candy's Lash Ink. I purchased this in a panic as I traveled Easter weekend and forgot mascara (with 25 other ones sitting at home no less!). A quick jaunt to Walmart and I decided I wanted to try a new brand. One of the ladies I know really like the Hard Candy products so I went for it. Mascara that won't quit until you do. Flatter your flutter for four days straight! Lash Link 4-Day Lash Stain defies the elements--paint on lashes and don't reapply mascara for up to four days. Your lashes will stay flawless no matter the circumstances! Paint on lashes and don't reapply for up to four days! The mascara comes in a very cool package (tube) and is in keeping with the branding. Young, edgy and faintly dark. I was feeling it. The container inside has the same look. The formulation is very wet (as you would expect in a ink). The first time I tried it I was taking out the wand like my other mascaras and brushing it along my lashes fairly aggressively and I noticed that some of it flicked on my face. You need to be careful! The wand is very separated and have defined bristle spirals. Very different from other wands I have used before. I am not sure if they grab the lashes and coat them as much as I would like, but as you can see from the picture below it does a credible job. One coat is very subtle, with no need to comb as there is absolutely no clumping. Very happy with the one step! Two coats definitely builds the colour, again with no need to worry about clumps or globs. This is probably a brand where a third coat would be needed for a dramatic look. I will say that the size of the wand is excellent for doing lower lashes. And they define them really well too!! I will admit that this mascara held up for the whole day. When you compare the pictures there is little difference in the mascara. End of Day rating: Hooray! Price is $6.98CDN and $7.00USD. So it is the least expensive full size mascara I have tried thus far. The 4 day lash stain is really not confirmed for me as I use waterproof eye makeup remover every night so I don't see it lasting on my eye. Would I buy again? I am not entirely sure as I am not convinced about the 4 day stain... And there are other mascaras out there with great lash payoff. The price is tempting though.